Fresh bread was a special treat when the troops decamped at Crown Point, a critical staging ground for the British. 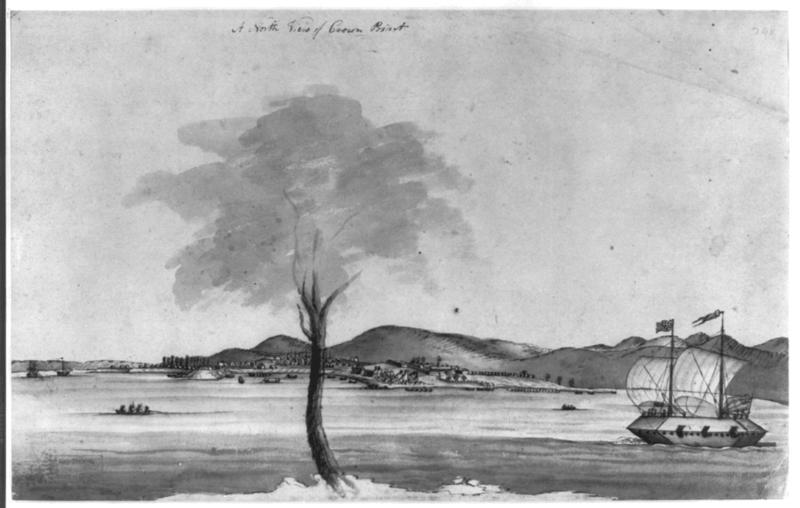 Contemporary view of Crown Point. Courtesy of Crown Point State Historic Site. 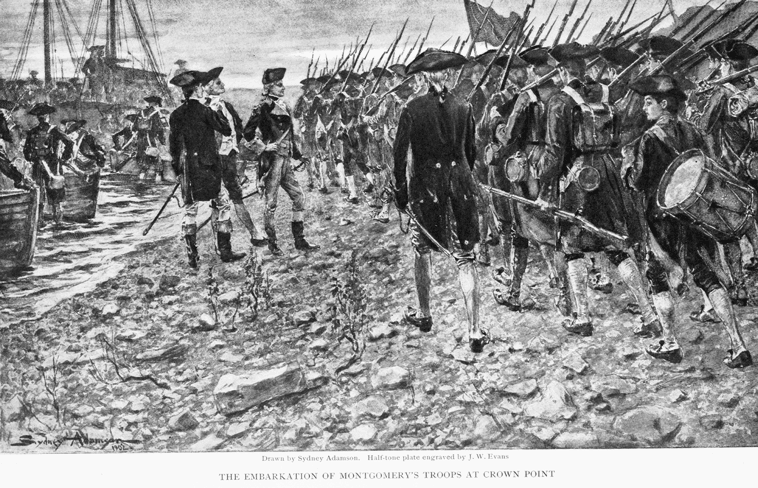 Crown Point c. 1759. Courtesy of Library of Congress. Crown Point, commanding the narrows of Lake Champlain 17 miles north of Ticonderoga, has a long and storied history. For one, it has earned a variety of distinctions: It’s the largest earthen fortification constructed in North America by the British; it changed hands many times during its existence, yet avoided ever being subjected to direct military assault; and on three separate occasions, Crown Point was destroyed at the hands of its own occupants. The original fortification was built as Fort St. Frédéric by the French in the 1730s to control the flow of traffic on the lake and to extend French military presence further south from its St. Lawrence base. When the French constructed the fort, they broke the Treaty of Utrecht with the British, which had established the southern boundary of the French as Split Rock. In 1759, during the French and Indian War, the French retreated to Canada to concentrate on defending Montreal and Quebec in the face of British General Jeffery Amherst’s advancing forces. As the French left, they razed the fort, including its massive four-story-high stone citadel and 12-foot thick walls. Amherst constructed an entirely new and much larger fort just southwest of the ruins of Fort St. Frédéric. Among the structures erected were stone barracks and an armory. The parade ground itself covered six acres and was surrounded by a formidably massive outer wall: Made of earth, stone, and timber, the wall was 22-feet-thick and 40-feet high. This new fort became known as Crown Point. With the end of the French and Indian War in 1763, the fort lost its usefulness and construction stopped. Crown Point was maintained by a skeletal British force. In 1773, army wives accidentally ignited a chimney fire. Sparks carried by the wind spread to adjoining structures, including the powder magazine, which set off an explosion, resulting in widespread destruction. For the next two years, Crown Point was, for all practical purposes, abandoned by the British. Although the fort itself had been rendered useless, a community of settlers remained, only to be increasingly harassed by Green Mountain Boys. 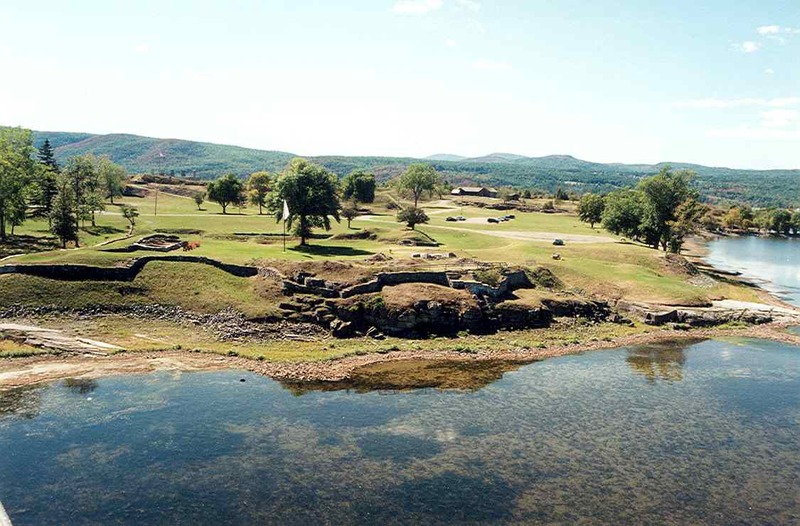 In May of 1774, a survey by a British engineer described the ruined fortifications as “…an amazing useless mass of earth only.” A year later, and two days after Fort Ticonderoga surrendered to Ethan Allen and Benedict Arnold, the “forces” at Crown Point—consisting of one sergeant, eight privates, and ten women and children—capitulated to Seth Warner and his party of Green Mountain Boys. For the remainder of the war, Crown Point became a camp and a staging area for both the Americans and the British. Burgoyne used Crown Point as a rendezvous point for his army. Crown Point, along with Chimney Point across the lake in Vermont, became the size of a small city. Nearly 14,000 people gathered here in tents and in ruins of the burnt-out homes. When Burgoyne’s soldiers arrived to Crown Point, their first order of business was to construct ovens for baking bread. The soldiers had been rationed a few weeks’ supplies, but the bread was already getting hard as a rock. As you approach the museum, you can see the replica bread ovens along the entry road. It wasn’t all easy sailing. The rocks and outcrops to the west of Bulwagga Bay provided a space for the Rebels to spy and fire upon the enemy below. The threat remained constant, but soon Burgoyne would embark against the enemy. Start track 10 after passing through Port Henry, after passing Edgemont Road on your right. Continue on Route 22 South until you see the sign for Crown Point Historic Site. Turn left toward the bridge to Vermont, then turn left again to enter the Crown Point Historic Site. Follow the signs to the museum. Tour the historic ruins of Crown Point and visit the newly renovated museum at this picturesque spot along the lake. Across the street, the Crown Point Pier and Champlain Memorial Lighthouse, also beautifully restored, are open to the public. When leaving, turn right out of Crown Point Historic Site and head south to Ticonderoga. Start part 2 of track 10 now. DeBro’s on the Way. A true diner experience with burgers, all-day breakfasts, great deserts, and more. 2749 Main St, Crown Point. Foote’s Port Henry Dinner. This 1920s railroad diner car has a great history, food, and lake view. 5 St. Patrick Place, Port Henry. Gene’s Michigan Stand. Aptly named, the roadside stop offers all the traditional summertime treats of hotdogs, burgers, and ice creams. 4201 Route 9N, Port Henry. Red Brick Café. A cute coffee house with fresh soups, paninis, salads, and crepes. 1 Star Way, Port Henry.